From Nick Tahou's, where the garbage plate was born. Why did I eat this? Because I hate my insides. Never doing that again. 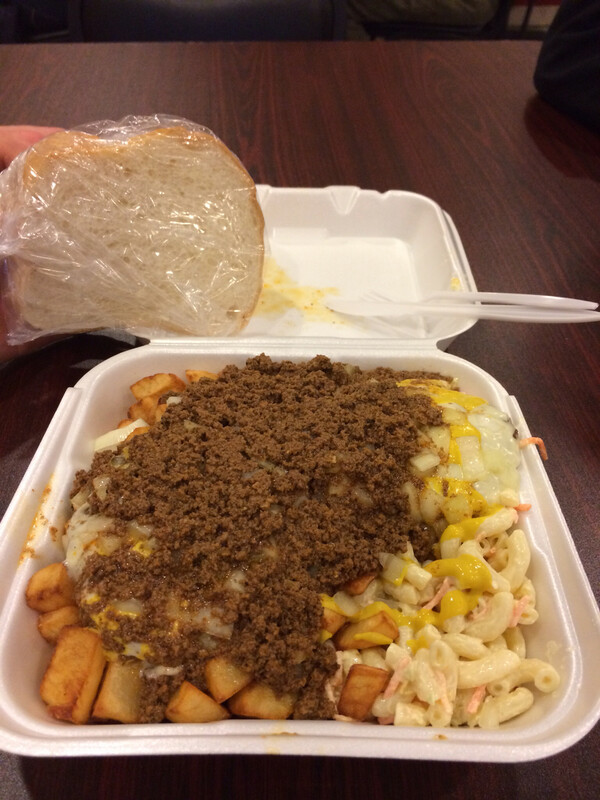 If you ask someone from Rochester, NY, what a Garbage Plate is, they'll probably make you eat one. Although the name isn't particularly appetizing on its own, you should know that the word 'garbage' here refers simply to abundance and variety, and there is no actual garbage involved. Imagine being in college, after a few too many celebratory drinks, rolling into your local greasy spoon, and asking the waitress for "one of those plates with all the garbage on it." That's how the Garbage Plate was born. 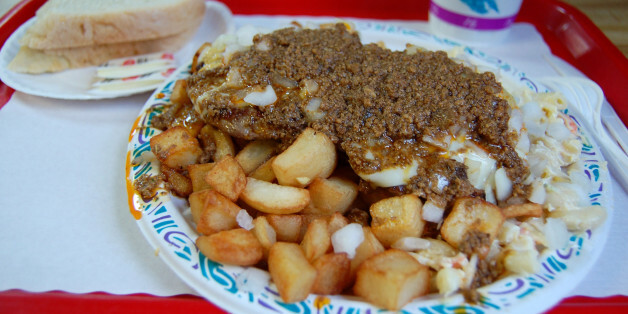 Garbage Plates are the number one reason that hangovers barely stand a chance in Rochester. They consist of a foundation of baked beans and/or macaroni salad with either home fries or French fries. On top, a choice of two: cheeseburger, hamburger, red hots, white hots, Italian sausage, chicken tender, haddock, fried ham, grilled cheese, or eggs. The crown jewel on this mountain of food: onions, mustard and Nick's signature hot sauce -- which is a ground meat chili like you'd get on a Michigan-style Coney dog. There are varying opinions on how to eat a Garbage Plate, but the conventional wisdom is that it should be done quickly, with plenty of ketchup. 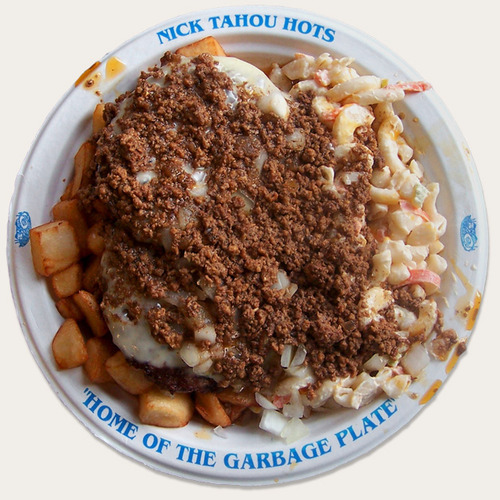 Although there are many different garbage plates in Rochester, and variations across America, the general agreement is that the garbage plate was invented at Nick Tahou Hots. This is what a perfect garbage plate looks like. You can also get a Garbage Plate to go, in case you either too hungover or too drunk to be in public. 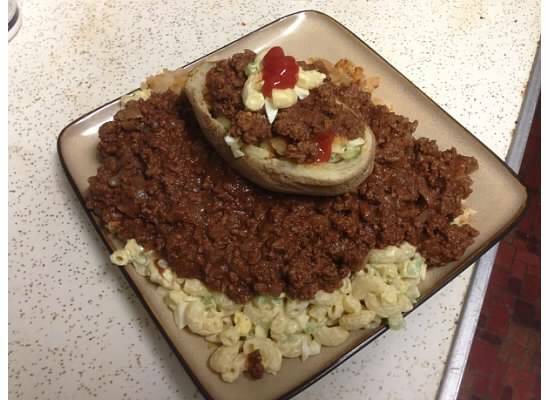 Garbage Plate cravings have even driven Rochester ex-pats to try to recreate their own at home, like this homemade Garbage Plate with a Garbage Plate stuffed potato skin on top. A+. And this is what true love looks like.